After a film away, Matt Damon is back playing Jason Bourne, and here’s the gritty photo to prove it. Producer Frank Marshall tweeted the first image from the film’s set and it’s pretty obvious this is a different Bourne movie. Different looking? Yes, but a lot of the big players are back. Bourne 5 (which does not have a title yet but I heard a rumor it may be The Bourne Enemy) is being directed by Paul Greengrass, who directed the second and third films in the series, The Bourne Supremacy and The Bourne Ultimatum. Writer Tony Gilroy took over the reigns for the fourth film, The Bourne Legacy which didn’t star Damon, and now Damon and Greengrass are back, along with Julia Stiles. Here’s Marshall’s tweet. So what’s going on here? 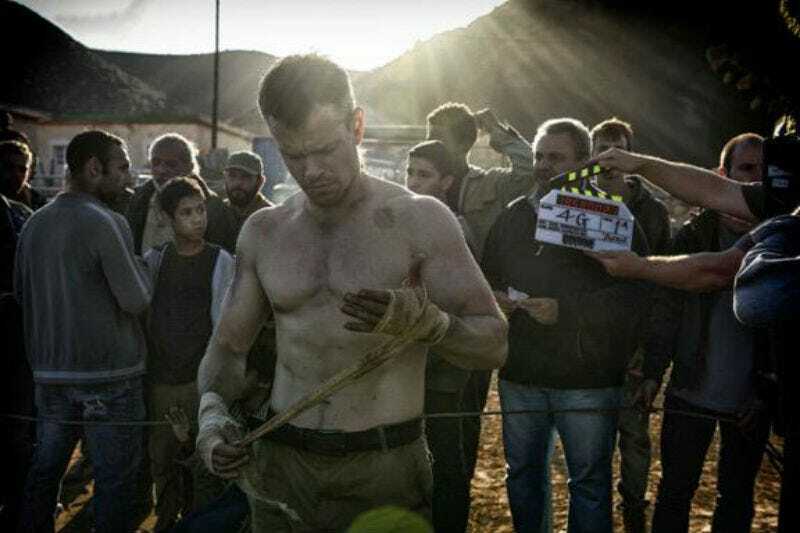 Is Bourne getting ready to fight? Farm? Are those people in the background extras? Members of the crew? Well, the clapper certainly makes it look like they’re extras, who are observing whatever Bourne is doing, and you don’t wrap your hands like that to bake a cake. What’s obvious though is this scene, whatever it is, is very rural. Mountains. Dirt. And that’s not really in line with Damon’s recent quotes that this film is set in, and influenced by, a post-Snowden era. Maybe Bourne has been captured and is a hostage? I’m just guessing. Bourne 5, starring Matt Damon along with Julia Stiles, Tommy Lee Jones, Alicia Vikander and Vincent Cassel, will be out July 29, 2016.